My wife and I are very disappointed you discontinued Cafe Vienna sugar free. We used over 50 cans per year and don't know what we will drink now. Please bring it back. Rick and Joan Henry. It is my understanding that it is still available but out of stock. 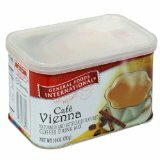 Currently you can be put on the waiting list to be notified when General Foods International Coffee, Sugar Free Fat Free Cafe Vienna Coffee Drink Mix is again available for purchase. You can make it yourself. There's lots of recipes all over the internet. I agree with Terri - please, please, please, bring back the sugar free Cafe Vienna - mornings are NOT the same without it! Are you listening Kraft/General Foods? ... Please bring back the sugar free Cafe Vienna - there is no substitution. And why switch to the French Vanilla - EVERYONE sells a french vanilla version; but no one else has the Cafe' Vienna! I am also nearly out of my stash purchased months ago. I'm down to only 1 can! This is my favorite after-work coffee - there is nothing else like it. Me too! I am so upset that I can not find it on the grocery shelf. I am diabetic and I can't use the other products because of the high sugar content. Plezzzze bring it back. Please bring back this extremely popular selling coffee. I have found NOTHING that I can substitute for Cafe Vienna, sugar free. Sugar Free Cafe Vienna - BRING IT BACK! I drank sugar free cafe vienna for years. I always bought 10 cans at a time when I found it stocked because the only slot in the section of Genera Mills International cCoffees that would be empty was this one. Logical question: Why would the company discontinue the only product on the shelf that was SELLING? Why not pull a non selling product and use that space to double product space for a product that is SELLING? If you check out the GF International Coffees website, you'll see it's no longer on their list of products. My fingers will be crossed that it will show up again, but I'm not optimistic. It's also been my coffee of choice in the AM for years. They have discontinued it under this name but it is being re-released under the Maxwell House International Cafe brand. Keep checking your local stores because they should be stocking again over the next few months. Do you know why we could never find it on store shelves? Because it was SELLING. Bring it back. This has been a favorite of my sister for years. Please consider bringing it back. Sugar free Cafe Vienna is the only flavor I drink and it's been my mainstay in the a.m. since the day it came out. Please get back to making this stuff right away! I've been trying to substitute one of the liquid coffee creamers but it's just not the same. Heloise has published a recipe for Cafe Vienna that you can make at home. It's close but not quite as good. so annoying that they have discontinued this product. it was the best part of my morning when i have to get up at 4am every day. need the caffeine but not the sugar. all the others are sugar free and decaf. u.g.h. I, too, am very disappointed that sugar free cafe vienna has been discontinued (I called General Mills yesterday to confirm that it will no longer be made.) I know it was getting more difficult to find in stores so I got to the point that when I did find it I bought every can on the shelf. I just opened my last can this morning. What ever will I start my mornings with?